What makes a strong vinyl fence? There are a lot of different vinyl fences to choose from on the market today. Without a little research how can you really know what you are buying? Inside a beautiful, well-built vinyl fence are reinforcements that are not visible once your fence is installed. 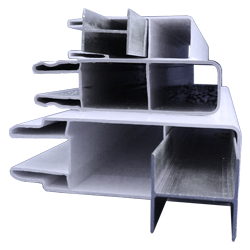 Made from both PVC and aluminum, together these reinforcing pieces will add strength to your fence. Over the years your vinyl fence will face some abuse and extra reinforcement is needed. 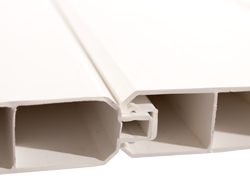 The internal PVC “ribs” and reinforcements are necessary for your fence to stand up to the impacts that will happen. These reinforcements are inside some of the different components or pieces that make up your fence. If you take a look at the inside of DFS rails and pickets you will see these reinforcements. Typically with pickets, the more internal ribs you see, the stronger the pickets and greater the ability to withstand different forces (eg. wind). Our rails also have ribs inside to add strength. When shopping for a vinyl fence, ensure the bottom rail has a metal insert in it to prevent the fence from sagging in the middle. 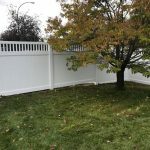 A cheaper vinyl fence will avoid the addition of metal inserts to make the product more affordable, unfortunately also making the fence weaker and prone to fall apart. 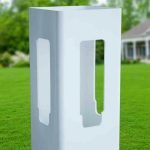 When installing your gate or if you have it installed for you make sure a gate post insert is used. This is a metal insert that goes inside the post that your gate attaches to and thus, should be cemented into the ground for extra stability. It is an option to use one on either side of your gate to add strength. If your gate is only attached to a vinyl post it is going to eventually sag and fail. For a fail-proof gate installation, ensure the gate is fastened to the metal insert inside the vinyl fence post.